Do you like home made jams and jelly? I do. 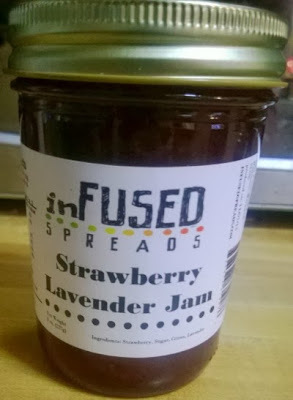 Infused Spreads makes some amazing artisan jelly, jams, and marmalade. They infuse unique ingredients with fruit and the taste is great. I really enjoyed the Strawberry Lavender Jam. I love buying homemade products when possible. I put this jam on my toast in the morning. I also tried putting it in the crescent rolls...that was yummy too. The Blueberry Ginger Jam was great. I put that on my croissant this morning and was very pleased. I'm usually more of a strawberry girl but the blueberry was pleasant and different. If you like something with a little heat or kick to it, you should try the Raspberry Jalapeno Jam. I wish I had some turkey so I could put it on my sandwich all together. Another fun thing to do is mix the jam with softened butter and then put that in the refrigerator. I know I have a butter problem but it's so good. I like that there is only a few ingredients in each jam. There is no high fructose corn syrup or artificial flavors. The flavors are unique and delicious. 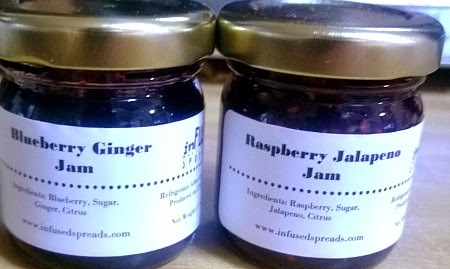 You can like Infused Spreads on Facebook or follow them on Twitter. Even better...check out their shop and buy something your taste buds will enjoy. Do you like peanut butter and jelly? Do you like jam on your toast?